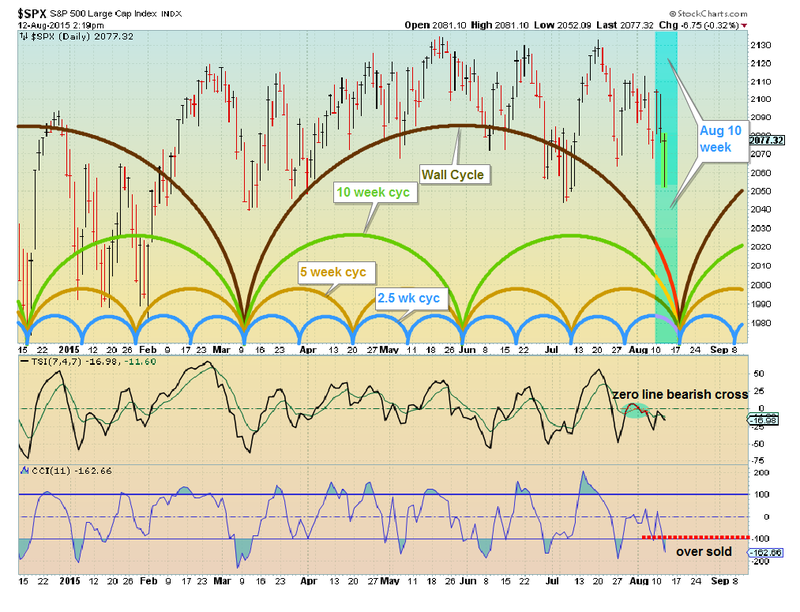 We may have seen nested bottoms Friday mid day, but may see a slightly lower low on Monday. no comment. totally agree. next top at the end of the week. by the way we have a divergence, the 8/25 should be a major top but let 's see. 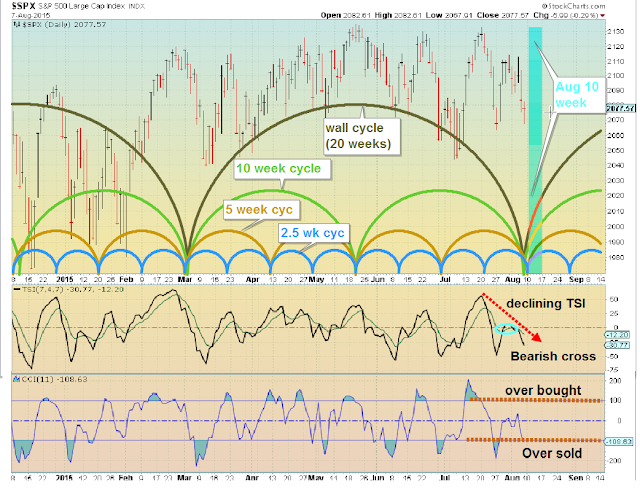 A top on the 5 week cycle should happen around 8/25 (and a bottom on the 2.5 week cycle). In the past (top 5 week, bottom 2.5 week) the 5 week appears to dominate. 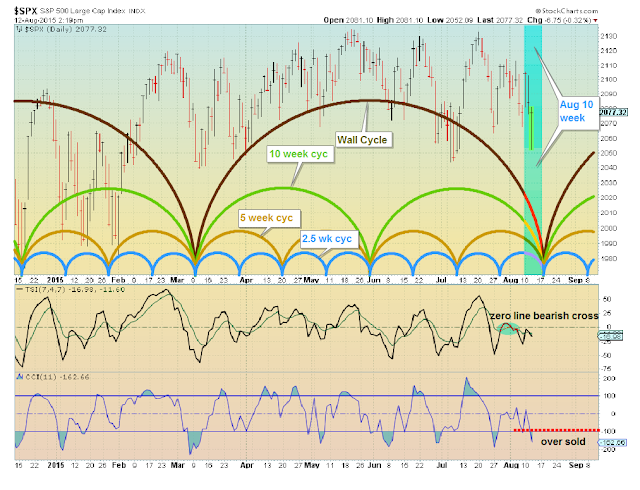 With the 10 week cycle and Wall cycles up there could be a top. Most likely a medium length/amplitude top, but let's see how it plays. Congrats for your nice blog!! If you also like my blog thetradingstrategist.wordpress.com you can add it to your blogroll. Many thanks!! Congratulate you for your good work! I just happened across your blog and truly find it fascinating. Do you ever have any coverage or analysis on the $RUT, or any Russell indices? Thank you for sharing this outstanding information. Actually I trade the Russell ETFs. Have a limit order (entered this AM) for RWM @ $58.51. Sold RWM Friday @ $60.05. Usually you will see a 3-4% move in $RUT over the period of a week and if your timing is good you swing between RWM and IWM for a 5% or so gain over a week... Usually my timing is less than perfect. Generally I avoid making specific stock buy or sell advice. If you can trade in sync with the general market and use index ETFs generally you can make returns regardless of market direction. It is not bad at all to have 3 to 4 days off for the forcast. 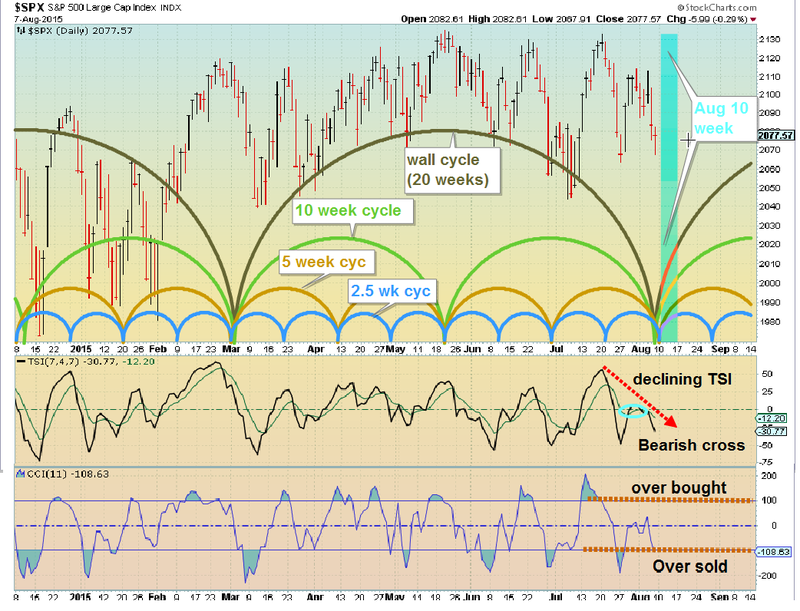 Today seems to be the bottom of the market as you predicted according to your cycle analysis. Only problem i have consistently with your work is that you keep moving the cycles back and forth to meet your targets. Respecting the work, but misleading cause these time frames dont vary that widely. I never argue with the data. If the data requires an adjustment then I adjust. If you have a better method please share it, because I have not discovered a perfect way of predicting the future. Over all I believe my projections while not perfect usually provide a fair representation of future outcomes. I try to make and note changes If I feel they are necessary. at the beginning of my blog I note the outlooks are simply my opinion and should only be used in connection with your own analysis.